Are you a hat person? 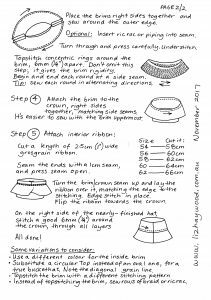 Have you ever sewn yourself a hat? 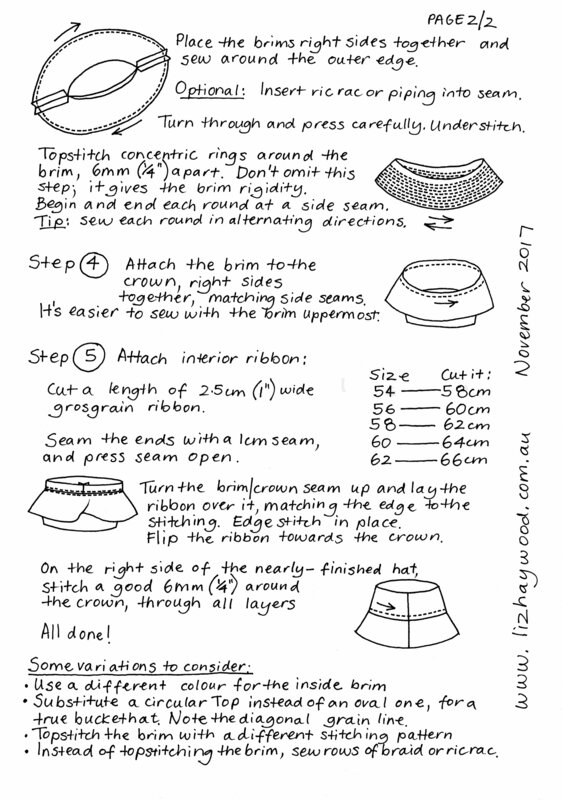 It’s been a while since I did a free pattern on this blog, but here is a hat pattern I hope you’ll like. 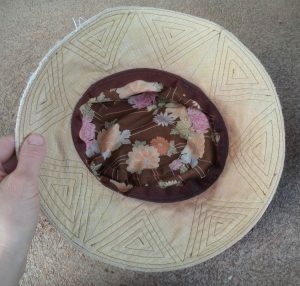 This hat has an oval crown, with side seams on the crown’s side and brim. It has a slightly deeper brim than a classic bucket hat. 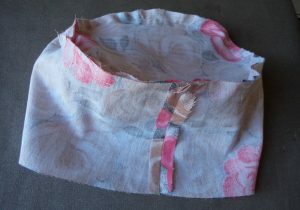 It’s easy to machine wash and can be squashed into a handbag or suitcase. 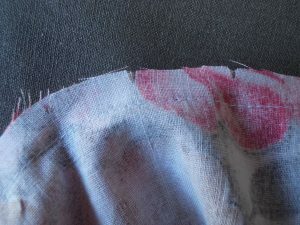 Fabric: Suitable fabrics are quilting cotton, drill, lightweight denim or baby cord. As always, choose a fabric that you love and will enjoy wearing. 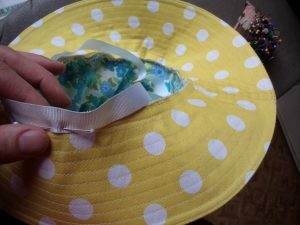 I used brown linen for one hat and yellow spotty cotton drill for the other. Both came from Spotlight a long time ago. 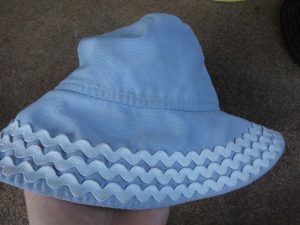 I was originally going to make a hat in baby cord (I was thinking of a Corduroy Day project). 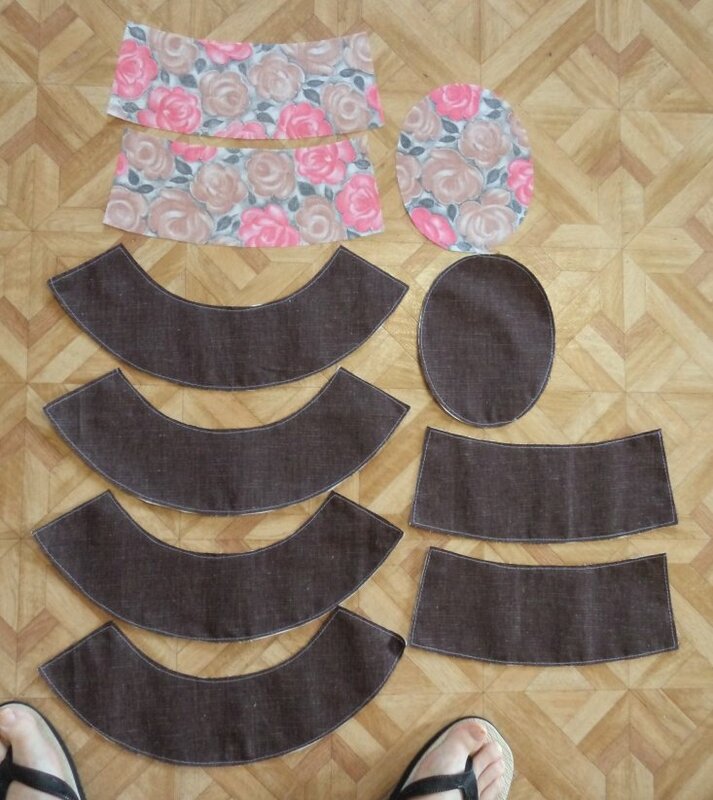 However, while I was searching for fabric I came across these offcuts which I liked better, and ended up making two hats. How much fabric? If you’re buying some you’ll need 45cm of 110 wide fabric, and the same of firm interfacing. A lining can be easily cut out of a fat quarter. However, you probably have something suitable at home in that fabric stash or left from something else. 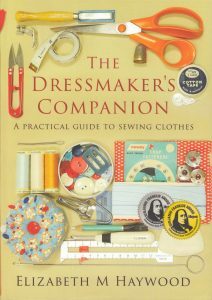 Choose a firm interfacing, preferably iron-on. I used Shapewell (a firm woven sew-in) because I didn’t have anything else handy. 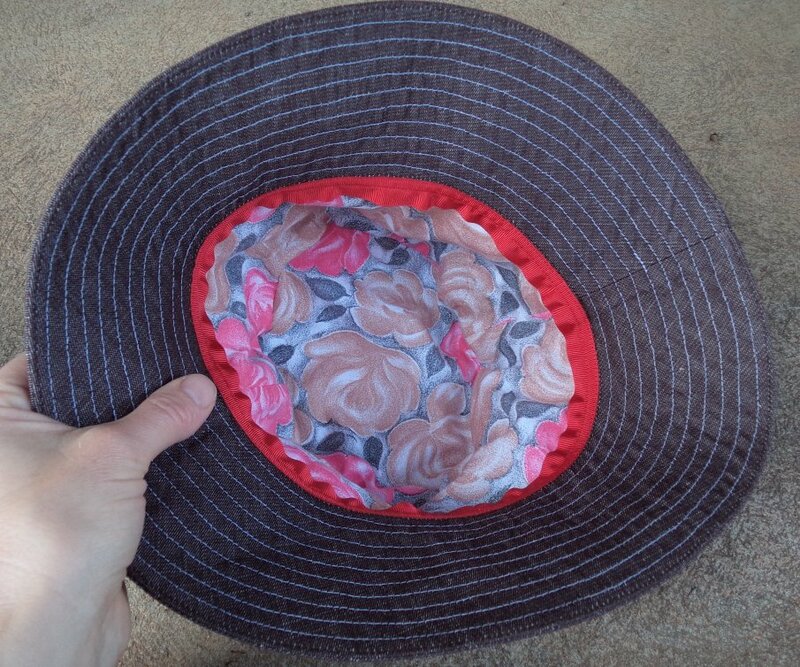 The brown linen hat has roses, from the collection of 1960’s fabric. 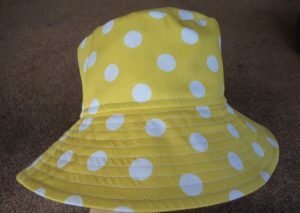 The spotty hat also has a lining cut from the collection of 1960’s fabric. 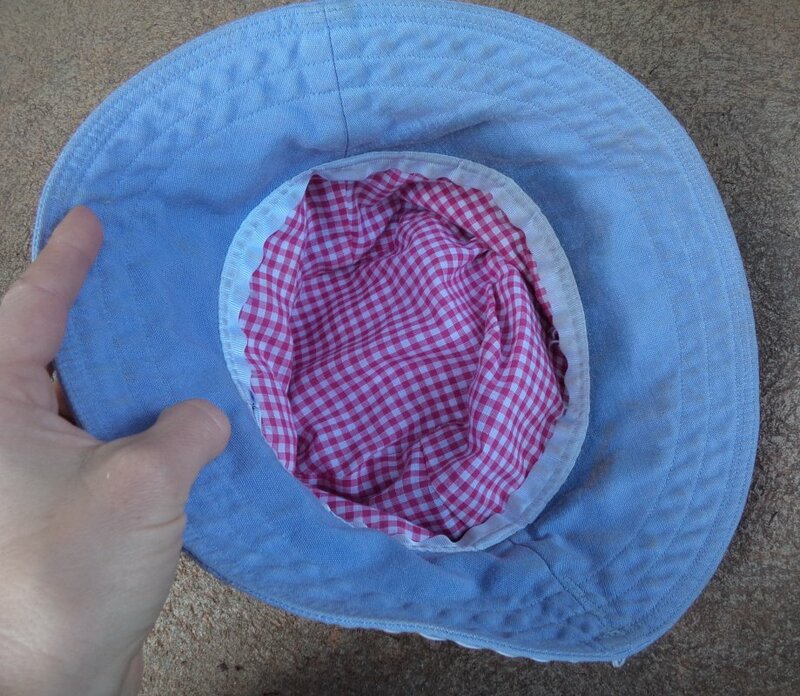 My old blue hat has gingham. 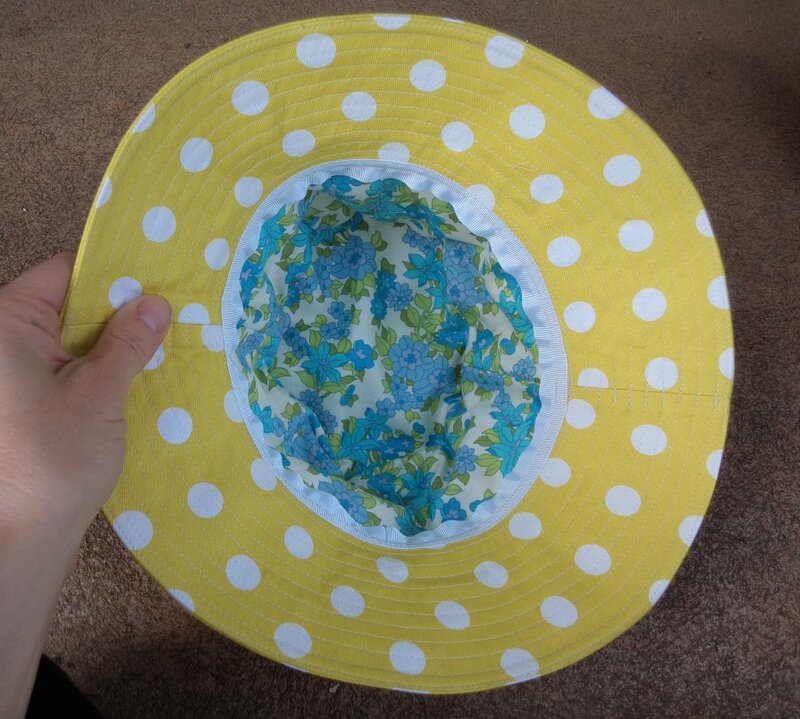 I’m wearing this hat while gardening here. My old old version of this hat has fabric from favourite skirt. Sizes and fit: You’d be surprised how many people in this world have big heads and have trouble finding hats to fit (or not, if you’re one of them). A survey once in my sewing class revealed one in four are above the “average” 56cm (22″) head size. 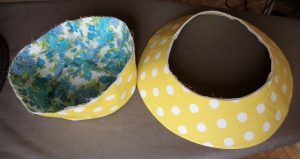 This pattern is in sizes 54cm, 56cm, 58cm, 60cm and 62cm head circumference; pick the size to match the measurement of your head. 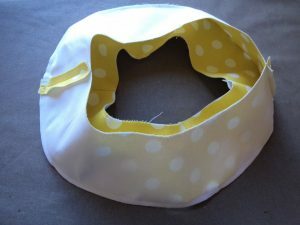 The pattern measures slightly bigger than the head measurement to allow for the stitching and the thickness of the fabric. If you discover you need to tweak the fit, the interior ribbon can be cut up to 1.2cm (1/2″) smaller or bigger than the instruction’s measurement, and stretched or eased onto the hat. 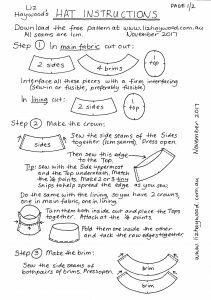 Patterns: Download the hat pattern – all sizes are together. It’s on 4 pages, landscape. Be sure to print at 100%. Sticky tape the sheets together matching the crosses at the corners. Step 1 Cut out all the bits. Step 2 Make the crown, one in lining and one in main fabric. 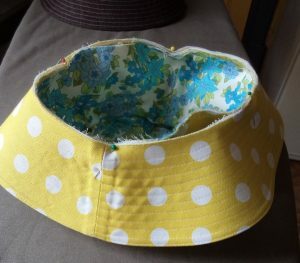 Sew the Top onto the Side with the side uppermost. 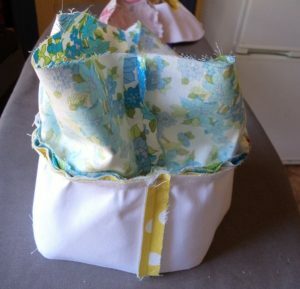 Make some tiny snips in the Side to help it match the curve while you sew. Join the two crowns together at the top, catching it at the quarter points. Step 3 Sew the brims together around the edge. …or some fancy stitching like my old old hat. 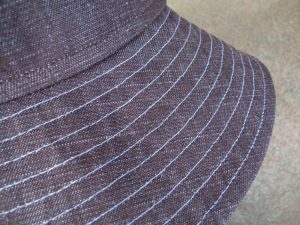 There are eight triangles around this brim. Step 4 The crown and brim ready to be joined. The crown and brim pinned together waiting to be sewn. Step 5 Adding the interior ribbon. Thank you Linda. I hope you have fun sewing it. 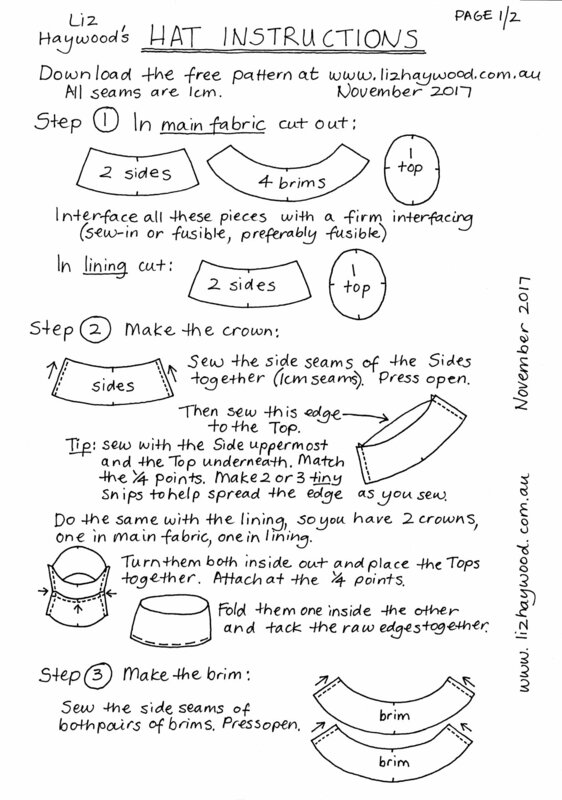 Hi Liz, Thank you very much for providing this pattern and excellent instructions- I really appreciate it! 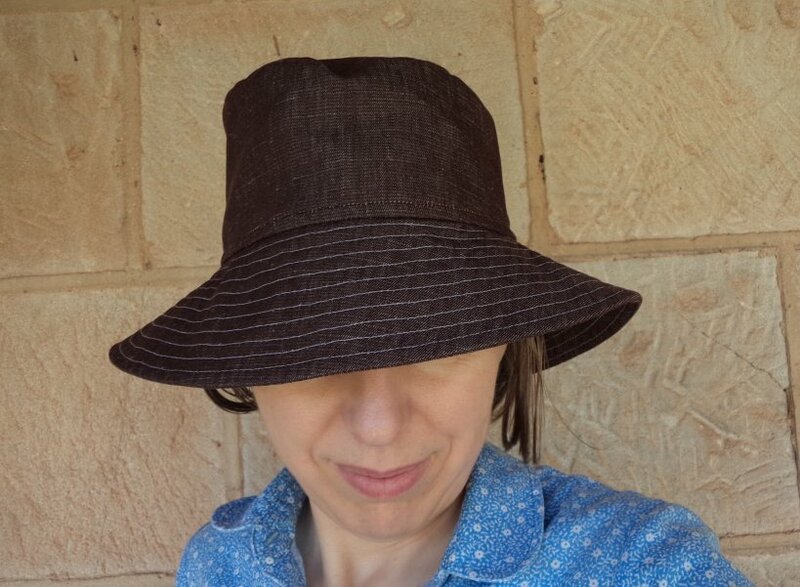 I just finished making this hat from 12oz canvas (it is for bush walking and general rough use). I would like to make another one straight away, but this time with a brim that isn’t quite as ‘dipped’. My wife loves the one I have already made so she can have it and I will tackle another. To make the brim less dippy, I would just make the brim pieces with a slightly tighter curve (as if they belong to a circle with smaller diameter), but to the same internal measurement (such that it will match the crown), wouldn’t I? Okay thank you very much again and have a great week. Hi Jim, I am thrilled that you enjoyed my pattern. When you say you’d like it “less dipped”, do you mean you don’t want it to sit so low over the eyes? 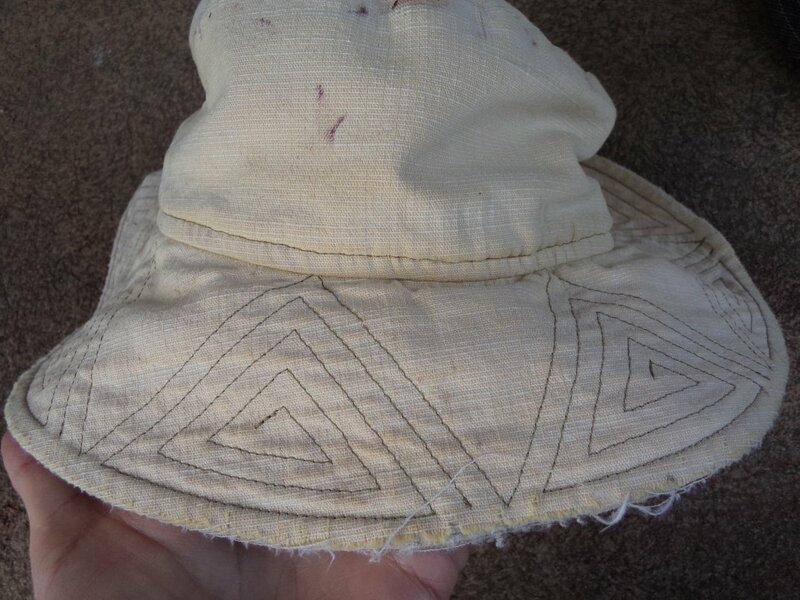 If so, you’ll need to “cut and spread” the outer edge of the brim (and, like you said, keep the same internal measurement so it will match the crown). Cut one out in paper and pin it to the hat you’ve already made to check it. Cheers!